Crusaders. Kingdom of Tripoli. imitation if Ayyubid silver. 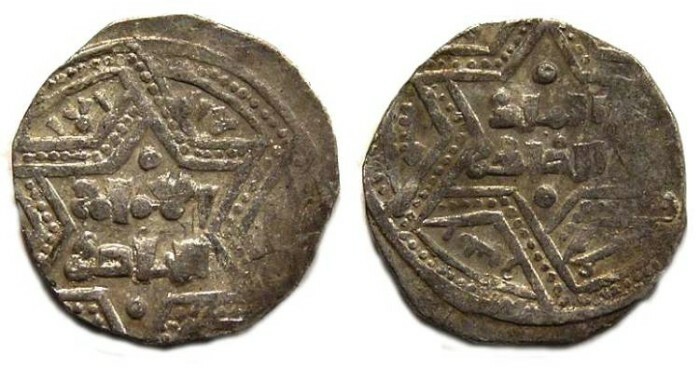 This coin imitates the silver Dirhems of the Ayyubid caliph al-Zahir Ghazi, issued at Allepo, and was probably struck for trade with the Ayyubids. Denomination : Silver 1/2 dirhem. Date : this type is posthumously dated AH 622 (AD 1225) but I am not certain if the date is on the flan. Reference : Album - 837. Size : 14.8 x 15.3 mm. Weight : 1.82 grams. Grade : VF with parts of the inscriptions off the flan (as usual). Obverse and Reverse : Arabic inscriptions naming caliph al-Nasir (Saladin) and the overloard al-'Adil Abu Baker, with the mint (Allepo) and the date of AH 622, which is many years after they were both dead.